MSM it is known in different ways: Organic Sulfur, Methylsulfonylmethane, or Methyl-sulfonyl-methane. It is a natural product, not a drug. You can find it in many plants, raw milk and raw cheese made from pastured cows, but the soils all around the planet are sulfur-depleted due to over farming, then the plants and animals we eat are deficient in sulfur as well. Hence the need to take Organic Sulfur as a supplement. 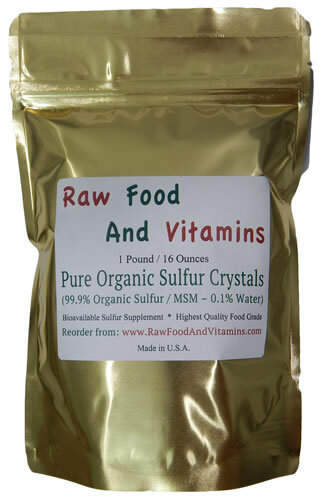 You have to make sure though, that you buy only pure organic sulfur (MSM). It is also used to treat allergies, constipation, ulcers, diverticulosis, premenstrual syndrome, poor circulation, obesity, high cholesterol and high blood pressure, liver problems, Alzheimer’s disease, type 2 diabetes, for any lung disorders, for autoimmune disorders and for CANCER. To reduce swelling and inflammation. To kill microbes in the blood stream. Start with small doses of MSM water because the stomach is not accustomed to drinking it. Take a gallon GLASS jug of purified water. If you do not have purified water, take water from the faucet and leave it resting for at least an hour before you use it because MSM should not be mixed with chlorinated water at all. Once you have your gallon glass jug full of the appropriate water, add 16 tablespoons of Organic Sulfur (MSM) into the gallon glass jug. Wait until the organic sulfur is totally dissolved. Sometimes it takes an hour for the MSM to completely dissolve. You can shake the gallon jug from time to time to make the organic sulfur dissolve faster. Do this until you finally see the crystals in the bottom of the jug have disappeared. Now you have MSM WATER. The first thing you have to do is to check for allergies, so take 1 tea spoon of the MSM water from the gallon glass jug and if you do not get any rash, (some people who are allergic to Sulfa drugs may have trouble with MSM), then two hours later, you can start with the dose below. It’s very important to do the dose just like it’s explained. Take 4 table spoons of the MSM water from your gallon glass jug. And this is all for Day 1 because the idea here is to make your stomach accustom to taking MSM, so, taking small doses also helps in avoiding big detoxification reactions due to the massive die-off of microbes. When lots of microbes die, lots of toxins are sent to the bloodstream and it can make you very sick. To avoid getting very sick and then very scared of MSM and wanting to stop taking MSM, it is important to do the doses little by little. Take 8 table spoons of MSM water. Take 12 table spoons of MSM water. You may experience some strange feelings in your head, but do not worry it is actually good because your brain is getting flooded with oxygen.